"The black novel ... describes men and women whose circumstances have pushed too far, people whom existence has bent and deformed. It deals with the question of turning a small, frightened battle with oneself into a much greater struggle -- the universal human struggle against the general contract, whose terms are unfillable, and where defeat is certain." -- Derek Raymond, The Hidden Files, as quoted by James Sallis in the introduction to He Died With His Eyes Open (x). note: My editions, with the exception of Dead Man Upright are all from Serpent's Tail (bought eons ago), but Melville House has them all as part of their International Crime Series. Ah, to have the talents of these writers, but such is not my lot, so on with my own take on these dark, unflinchingly raw, heartbreaking and excellent novels. "obscure, unimportant, apparently irrelevant deaths of people who don't matter and who never did." "We saw it without the church, without the priest, without the funeral parlour; no hymns, just the dead body stiffening, sometimes in one, sometimes in more than one piece; we saw death suddenly, when we had a hangover, called out to the raw dank place where death was when we weren't in the mood, like a cabbie picking up a client obliterated by the dark on an empty road." (Dead Man Upright, 24). 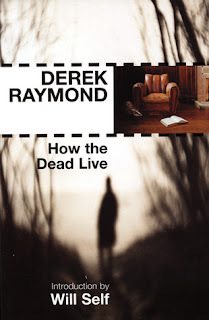 "Raymond was a writer of great complexity, who wrote with a nearly unmanning combination of fury and compassion as he chronicled the austerity of Margaret Thatcher's England." His work here in the Factory series, as whoever writes the back-cover blurbs for Melville House says, is an "unrelenting investigation into the black soul of Thatcher's England," but really, it's not difficult to see in these novels that Thatcher's England has become pretty much soulless; it's not just the buildings that are in decay and left to rot, but also the souls of some of its inhabitants. "the desperate last fugitives of a beaten, abandoned army, their dignity, rights and occupations gone (or never known), their hope gone, tomorrow gone." He often encounters those "made invisible in their misery by the frozen night," for whom he could not get any justice "until they were dead" (How The Dead Live, 25-26); and as the series progresses, we learn why justice is so important to him and what it is that motivates him to solve these cases that are sent his way. "Though Staniland had died at the age of fifty-one, he still had the innocence of a child of six. The naive courage, too -- the desire to understand everything, whatever the cost...The fragile sweetness at the core of people -- if we allowed that to be kicked, smashed and splintered, then we had no society at all of the kind I had to uphold... I knew I had to nail the killers...Not just know them. Nail them." It is the detective's ability to establish this connection between his victims and himself that is at the heart of these five novels; it is also this particular quality which makes these books so emotionally taxing to the reader, since as the detective uncovers what it is that has brought these people to where they are now, we simultaneously learn more about what it is about him that has brought this man to do what he does. We also come to understand just how much the past continues to haunt the present, another idea that runs throughout this series. 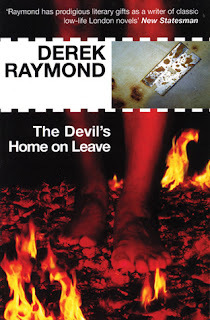 The Devil's Home on Leave takes a bit of a different path, since at the beginning of his investigation of a most brutal, grisly crime, the killer's MO narrows down the identity of the suspect. What's left in this case is for the detective to gather proof against the perpetrator, which is going to be challenging since this man has no conscience, no fear, and nothing to lose. And while I didn't particularly care for the direction that this story ultimately took, we learn much more about the detective's heartbreaking past and how it is that he has come to "understand murder" so well. By the time I'd finished book three, How the Dead Live, and book four, I Was Dora Suarez, I was sort of wishing I hadn't read all four in a row. I felt much like I did the time I binge watched the TV version of David Peace's Red Riding Quartet, after which I was like completely gutted. (Do NOT make that mistake; trust me on this one). There is the deepest sort of pain to be found in both of these books; different, but pain all the same, and there's so much here that it takes its toll. In How the Dead Live our detective is sent to look into the case of a missing woman, a doctor's wife whose absence had gone unreported. His efforts are stymied as he runs into a wall of silence from just about everyone in the small village of Thornhill, but when he finally learns the truth, it's his compassion that takes over in an extremely sad and tragic situation. Meanwhile, his uncomprehending and unwanted superiors, sensing the headlines to be made over the case, decide to bulldoze their way in, and the nameless one goes to great lengths to see the right sort of justice through, even at the potential cost to his career. 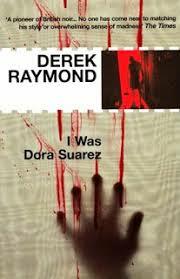 While looking for reviews about these books, I came across an article in The Australian mentioning that crime novelist Ian Rankin once called Raymond's I Was Dora Suarez "`English crime fiction's equivalent to Edvard Munch's The Scream." I'd say that's about right. 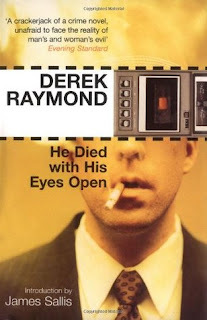 He also notes in that article that Raymond's books are not only novels, "but also reports from a front line of casual cruelty in a world lacking empathy," again, spot on, and while that idea is apparent in each and every book in this series, it is especially true here. Not only does the title character, Dora Suarez, live in a "world lacking empathy," she also inhabits a world where the sickest, lowest, and meanest people lack any sort of conscience. Once that book was over, not only had I had enough of Derek Raymond for the moment, but I had to sit and regroup for two days before I could move on to the last book, the first night with sizeable portions of bourbon in hand. James Sallis, in his intro to He Died With His Eyes Open, referred to I Was Dora Suarez as a book that sends electric shocks through your system (see below), which it did -- it is so powerful in fact, that I don't want to say too much about it. It is not only tragic because of the horrid death of Dora Suarez and of her older housemate but reading further into it, it's also a case that will drive the nameless detective further than ever in his quest for justice. And how sad is it really, when a lonely, haunted man finds the woman of his dreams only after she's dead? There's much much more indeed, but let's leave it there. Of all of the books in this series, this one is best experienced cold, with not much known about it ahead of time. What I will say is that in my opinion, in I Was Dora Suarez we find everything Raymond has written about in the previous novels fully realized in a way they hadn't been before to this point, and perhaps that's why I found it to be the most powerful of all of the Factory books. And finally we come to the end, with Dead Man Upright, which is a bit of a departure from the rest of the series in some ways, but in others, not really. For just one thing, there isn't a specific crime that brings the nameless one into the case, but rather a potential crime. In a pub and drinking beer with a friend, our detective hears from his old police buddy about the strange behavior of an older man, a certain Henry Cross, in his building, whose dealings with different women have captured the interest of the detective's friend. As he puts it, "there's something that smells dead off about it." Once the nameless one assures his friend he'll look into it, he searches the older man's apartment, and finds some pretty chilling signs that his friend's intuition was right, and that the man most likely dangerous and needs to be off the streets. But what he doesn't find is a body or any sort of evidence at all that points to a specific crime -- all he can do is warn the potential victim while he tries to catch what he believes to be a serial killer before it's too late. But she's having none of it, since for her, he's her only chance at happiness in an otherwise dreary life. 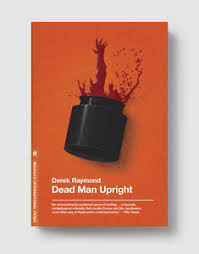 And while I won't give away the rest, Dead Man Upright delves into one of the darkest places there can be -- directly into the mind of a psychopath. It is my least favorite of the five, but still very, very much worth the read. After finishing the entire Factory series I can certainly attest to the "electric shocks skittering and scorching" that not only went through the whole of me, but also sort of imprinted themselves into my brain in their wake, probably to leave a mark forever as to how I approach and engage with crime writing. They are, as the back cover blurb from He Died With His Eyes Open notes (again quoting Sallis), "literature written from the edge of human experience," and they indeed seem to exceed the "limits of the crime novel and of literature itself." 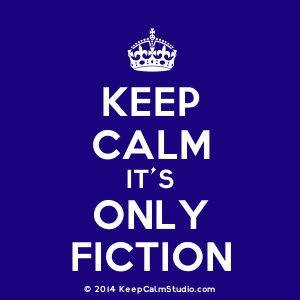 The fact that the main character is a detective working for the police in London might make anyone believe that Raymond's novels are yet just another series of police procedurals, but that is absolutely not the case and reading them as such is just plain folly. These books are among the darkest of the dark in the realm of crime fiction, and are not for everyone, and for those who do read them, beware the toll they take on your wellbeing for the duration. I loved these books and there will never be anything like them again, I'm sure. Nancy, I would love to read these books! They're so difficult to read!